Global Shell Games explores the hidden world of shell companies, which are a corporate veil, hiding the identities of those who pull their strings. These faceless companies are often used by their unknown owners for money laundering, sanctions-busting, tax evasion, and even the financing of terrorism. Every year a staggering number of unidentified shell corporations succeed in hiding perpetrators of terrorist financing, corruption and illegal arms trades, but the degree to which firms flout global identification standards remains unknown. Adopting a unique, experimental methodology, Global Shell Games attempts to unveil the sordid world of anonymous shell corporations. Posing as twenty-one different international consultants, the authors approached nearly 4,000 services in over 180 countries to discover just how easy it is to form an untraceable company. Combining rigorous quantitative analysis, qualitative investigation of responses and lurid news reports, this book makes a significant research contribution to compliance with international law and international crime and terrorism whilst offering a novel, new approach to the field of political science research. 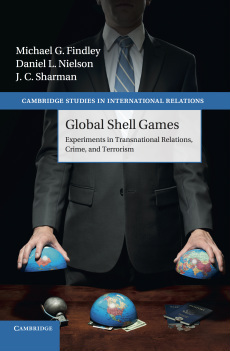 Global Shell Games is an invaluable resource for scholars of international relations, and a fascinating, accessible read for anyone interested in learning about worldwide criminal practice in corporate finance. Global Shell Games explores the hidden world of anonymous shell companies—corporate entities that function only to hide the identities and machinations of those who pull their strings. These faceless companies are often used by their unknown owners for money laundering, sanctions-busting, tax evasion, and even the financing of terrorism.